Calling all fishermen, grillers and cooks! 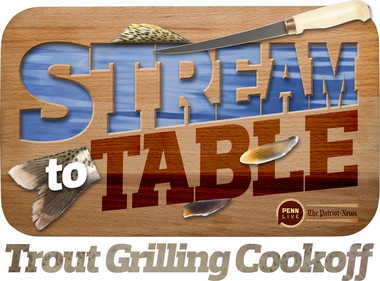 PennLive.com and The Patriot-News is sponsoring its first Stream to Table Trout Grilling Cook-Off. I’m proud to say I’m joining judges Marcus Schneck and Sue Gleiter to help narrow down the competitors. If your recipe is selected, you’ll join the other contestants at Gifford Pinchot State Park on April 27 for a grill-off! Pinchot will supply the fresh-caught, whole fish, a charcoal grill and you work your magic. Local chefs will judge the edible creations. To enter, email your favorite grilled trout recipe to mschneck@pennlive.com and include your name, address and phone number. The winner will receive a $200 Cabela’s gift card. 5th place – a Roundtop Mountain Resort Adventure Package for Mountain Adventures (ages 5 and older), valued at $78. Every recipe entry will be entered into a random drawing for other prizes related to grilling, trout, fishing and the outdoors. Spectators also are welcome at the grill-off and will eligible for addition prizes, including books, poster sets, calendars, patches and more from the Pennsylvania Fish and Boat Commission and the Pennsylvania Department of Conservation and Natural Resources; autographed nature books by me; a grilling tool set; and more.